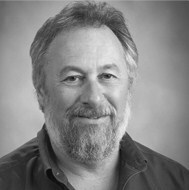 Colorado State University English professor John Calderazzo's stories, essays and poems have appeared in Audubon, Brevity, Georgia Review, L.A. Review, North American Review, Orion, and elsewhere. His last book was Rising Fire: Volcanoes and Our Inner Lives, essays which explore how volcanoes around the world have affected human culture. He has won a CSU Best Teacher Award and has been cited in Best American Essays and Best American Stories. He is co-founder of an innovative teaching-climate-change-across-the-curriculum program and has been funded by the National Science Foundation to produce YouTube and iTunesU videos for climate change classroom teaching. Last week our bus rattled down another mountain pass, picking up speed. Then someone shouted, “Monkeys!” So I twisted around fast, but they were gone. Besides, I'd been staring at rhododendrons that looked like giant, dusty roses. They were a miracle at 8,000 feet, but they weren't monkeys. Yesterday morning, aiming my camera at a stone wall spilling molten orange bougainvillea, I heard John and Mary come back from a walk, laughing about golden langurs playing in a tree. I imagined slender branches dipping and swaying, the whole tree twitching like a mind on fire. But when I hurried down the road, I found only boughs and leaves. Today, at Trongsa Dzong, an ancient fortress-temple said to be hung with beehives and ledge-swinging monkeys, I glanced at sturdy monks-in-training hauling water or smiling as they swept stone courtyards a grain of Himalayan dirt at a time. Soon, I was working my binoculars over the tiled roofs, over the eaves above the whitewashed, mandala-bearing walls. Oh, monkey mind! Monkey mind! Here I am, more than halfway through this froth of life, and have I still learned nothing?